The first key word here is “personal” – it seems obvious but is a vital place to start. A dashboard must be targeted at an individual or at least a role within the business. The common practice of “general use” dashboards that show stats for the whole business is probably only of value to the CEO. For everyone else it is at worst crowded with irrelevant stats and at best unactionable. Let’s pick on that word “actionable” – what we mean here is that feedback that I can’t do anything about is not worth having – that just ends up in the category of “news” – akin to wars in far off countries – outside my remit of control and influence. Actionable stats are those that I can directly control or influence myself. That’s really important in dashboard design because if something has gone wrong then I should be able to correct it. Dashboards need to be “engaging“. The medium is part of the message. Boring dashboards can easily be ignored as irrelevant, dashboards that lack sparkle can drain the life out of even the keenest optimiser. Engagement can be provided in many ways, there are countless mediums: host your dashboard on a big screen TV ( a popular choice), serve it up through social media stories or a visually arresting email or even produce a full page glossy report. Read this article if you want more detail about this. The key though is to evaluate your dashboard design on the “engagement” factor. You’ll be surprised how a little work here can go a long way to driving adoption. You need to create a “feedback” loop. I do something, I get the feedback, I optimise to suit. This feedback loop is the critical aspect of the dashboard – if I do something but the feedback is badly timed or non-existent then the dashboard fails me. I love the little word “trigger“. Triggering something implies that the dashboard actually does something. You know it’s true whenever you see the red light indicator on your car fuel gauge. There’s a sense of action – the dashboard isn’t some passive instrument, letting the fuel gradually run out before you notice. No instead it provides a trigger that in turn prompts action. Again, the section on “distribution channels” in this article provides a helpful description of how the constraints of different mediums can be used to drive triggers – a daily newspaper has greater impact than 24 hour rolling news because it only comes out once a day. I include the word “timely” in my definition because we are limited beings, we don’t want optimisation to be something we get round to eventually. In built in the dashboard should be a deadline of when we are expected to act by. I love weekly dashboards as implicit in weekly stats is the idea that you need to have improved by next week, when the dashboard will be released again. And finally “behaviour change” – a good dashboard is all about directing permanent behaviour change, the formation of good habits for example. If you change nothing then nothing changes. Behaviour change is the whole point, without it, we may as well pack up our dashboard and go home for, it’s nothing more than a set of pretty lights and flashing indicators. 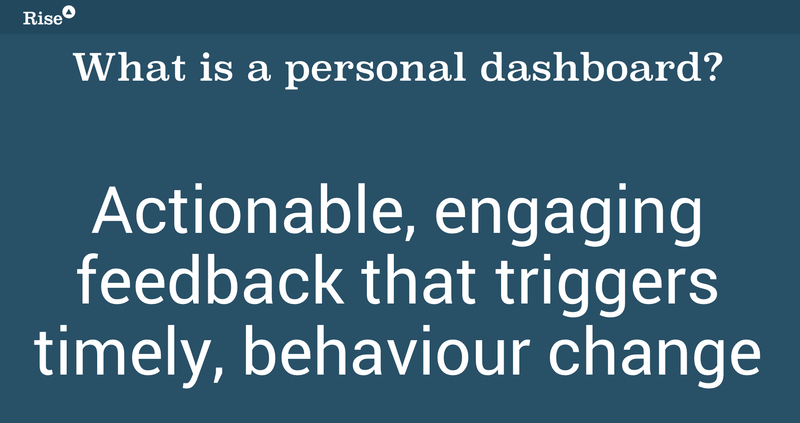 Ok so we’ve explained our terms and generated a working definition of a personal dashboard. Does it work for you? What would you add or subtract from this definition? If you’re all good to go then keep it with you, print it out and use it to evaluate the dashboards, scores and leaderboards that you create.